Ice-Magic: Lord Ewald can, at will, project in various forms quantities of ice and snow through his hands just enough to down an opponent. He can create platforms of ice upon which he can skate. He is able to generate larger amounts of ice and snow, and conjure massive icy figures. 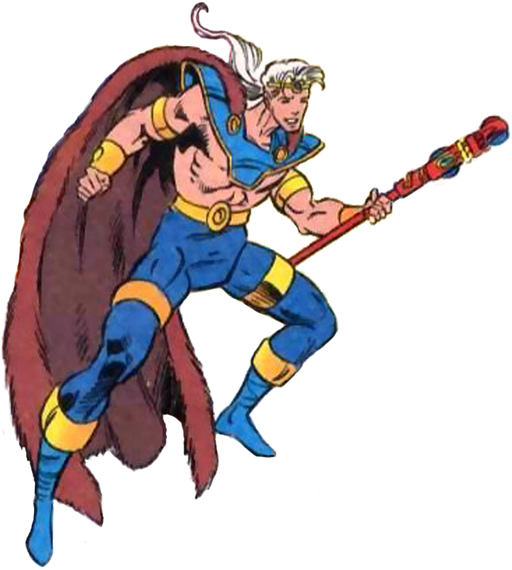 Staff: Ewald was given a staff by Overmaster that allowed him to channel Overmaster's power, allowing him to project energy blasts and fly. Ewald Olafdotter is the hero Ice's brother, he took control over Ice's homeland from her father, King Olafsdotter with the help of the villain Overmaster.